By Angie Drobnic Holan on Wednesday, October 7th, 2015 at 10:54 a.m.
McCarthy made the comments during an interview with Sean Hannity on Fox News. We wanted to look at McCarthy’s comments in their full context and let readers judge what he meant for themselves. The Hannity interview wasn’t the friendliest. Hannity focused on whether Republicans in Congress were doing a good enough job at stopping President Barack Obama’s agenda. Hannity kicked off the interview with this question: "60 percent of Republicans polled this week feel betrayed by the Republican Party in Washington. Are they justified? I'm one of them." We should note that in a subsequent interview and statements, McCarthy has said the committee was not political, calling its integrity "beyond reproach." Hannity: "Let me ask you this. You voted 50 times to repeal Obamacare, but there's a constitutional power you guys have that you don't use. And it seems all Obama has to do is mention we're going to shut down the government and blame Republicans, you fund Obamacare. You fund executive amnesty, which you told us, the whole Republican caucus told us they would stop, if we would elect the Senate last year. They funded it. And you're about to fund Planned Parenthood." McCarthy: "Sean, no, Sean, amnesty is not going on. The courts have stopped that. There's no funding there. And there should not be as we go forward." 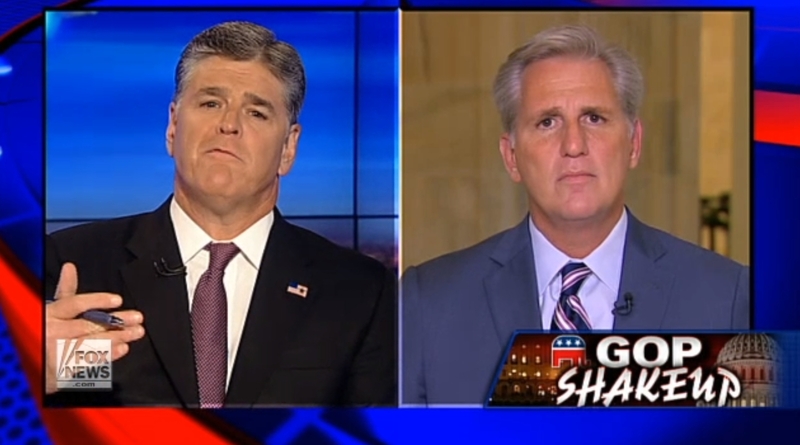 Hannity: "But in February didn't you guys end up funding it, you passed the Cromnibus, you gave up your leverage." McCarthy: "No, no. Sean, no, because the courts had put a stay on that. So there was no funding going towards that. The question I think you really want to ask me is, how am I going to be different?" Hannity: "I love how you asked my questions. But go ahead, that is one of my questions. Go right ahead." McCarthy: "I knew you'd want to ask it. What you're going to see is a conservative speaker that takes a conservative Congress that puts a strategy (in place) to fight and win. "And let me give you one example. Everybody thought Hillary Clinton was unbeatable, right? But we put together a Benghazi special committee, a select committee. What are her numbers today? Her numbers are dropping. Why? Because she's un-trustable. But no one would have known any of that had happened had we not fought and made that happen." Hannity: "I agree. I give you credit for that. I give you credit for sequestration, I'll give you credit where credit is due. But here's what every conservative wants to know. Are you willing to defund Obamacare and use your constitutional authority? Are you willing to use the power of the purse to defund Planned Parenthood? Will you use the power of the purse to stop the power grab of this president through the use of executive amnesty, ignoring our laws and our constitution? If you're speaker, will you go into your conference and say, this is what we should do, we need to unite together?" McCarthy: "I will unite them and, yes, we'll do it. But you know what. We're not going to do it when we have one day. This is what we're going to do, Sean, and we're not going to be able to do it alone. We're going to put a strategy today just as we do a select committee on Planned Parenthood. So we go out across the country and they see — the president won't even watch those videos. The Democrats won't watch those videos. We need America to watch those videos. And you know what, we need your help as well. We need to come together, okay?"